If you're looking to re-roof your old home or if you're building a new home there are few roofing materials that match the effectiveness and affordability of asphalt shingles. There is a reason that this type of roofing is one of the most popular choices in America. It's low cost, low maintenance and highly durable, making it an appropriate choice for your next roof. Here are 6 benefits of asphalt roofing to consider when making your your roofing material selection. Because of the roofing industry's ability to mass produce asphalt shingles in bulk they are very affordable. As much as 80 percent of housing in America uses asphalt shingles. This means that the procedure and technique for installing them has been mastered by many roofers, ensuring a smooth and fast installation. If the roofing ever becomes damaged due to weather related issues or some other incident repair is quick and easy. Replacement shingles are readily available and replacing damaged shingles is quite simple for an experienced roofer. There is a reason these shingles are so popular, they look great! 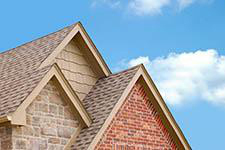 They are available in various designs and colors, ensuring you'll find the perfect shingle to top off your home. The weight to durability ratio provided by asphalt shingles is very high compared to other types of roofing materials. This means you won't need to do any restructuring when doing a roof replacement adding an asphalt shingle roof to a new home. Aside from removing wind strewn tree branches and leaves, there is little that needs to be done in order to keep your asphalt roof looking great. They have a long life span even when little attention is paid to the roof. You certainly have plenty of choices when it comes to roofing materials, but none provide quite the cost to benefit ratio as asphalt shingles. If you are interested in asphalt shingle roofing in Wichita Falls, TX, McKinney, TX or the surrounding North Texas communities, don't hesitate to contact Trifecta Roofing & Construction. We provide expert residential roofing for all types of roofs! Give us a call at (469) 620-7672 to learn more about our Wichita Falls roofing company, or to request an estimate!